A review of some key market-based indicators shows that the market's outlook for economic growth is has only improved marginally from sub-par levels. More importantly, however, there are few if any signs in the market that the Fed's plans to raise short-term rates modestly, while slowly paring down the size of its monster bond portfolio, pose any threat to growth. This tells me that the Fed is moving in the right direction, and its caution is warranted. The Fed is proposing to move slowly and cautiously to take steps to bolster the demand for money (by raising the interest rate it pays on excess reserves), now that there are increasing signs that money demand is beginning to ebb. I reviewed this in detail in a post last month, "Something to worry about." As long as the Fed keeps the supply of money in line with the demand for money, we won't have to worry about inflation. So far, it looks like they have been doing their job, since inflation has been relatively low and stable for quite a few years, and forward-looking inflation expectations have not increased. This first chart is one of the most important. Although neither the press nor the Fed normally talk about the inflation-adjusted Fed funds rate, that is the monetary variable which is the most important for the economy, since it sets the floor for the true cost of borrowing and the true benefit to saving. Today, the real rate of interest on overnight money is slightly negative (the funds rate is 1.25% and the inflation rate is about 1.5%). It's a lot less negative now than it has been for most of the current recovery, but it's still the case that although real borrowing costs are negative and real savings rates are very low or negative. This has been the case for years, and we have yet to see any unpleasant consequences. It can't go on forever, however. If the Fed holds the real funds rate to an unreasonably low level, that would inevitably result in an imbalance between the supply and demand for money, and that in turn would result in rising inflation, a weaker dollar, and rising gold and commodity prices. 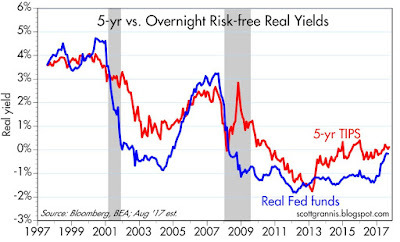 The real yield on 5-yr TIPS is best thought of as the market's expectation for what the real Fed funds rate will average over the next 5 years. 5-yr TIPS today carry a real yield of only 0.1%, while the current real yield on the Fed funds rate is about -0.15% to -0.25%. That means the market expects only very modest "tightening" from the Fed over the next 5 years. This squares with implied forward rates which show the Fed raising rates only 2 or maybe 3 times over the next several years. 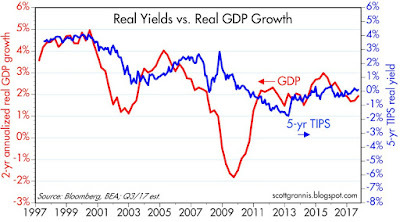 Both the market and the Fed believe that interest rates need rise only modestly, and that in turn implies a belief that the economy will not pick up significantly from its 2% trend rate of growth that has prevailed since 2009. As I've said many times before, one thing to watch for and worry about would be the nominal funds rate exceeding the 5-yr real TIPS yield. That would be the market's way of saying that the Fed is entering "tight" territory and thus threatening real economic growth. The chart above is also very important. It shows that every recession in the past 60 years has been preceded by a substantial tightening of monetary policy. Monetary policy is tight when the real Fed funds rate (blue line) is at least 3-4%, and when the Treasury yield curve (red line) is flat or inverted. We are likely years away from seeing those conditions. As the chart above suggests, today's very low level of real interest rates is consistent with real GDP growth of about 2%. If the market today were convinced that major tax reform is going to happen in the foreseeable future, I have to believe that real interest rates would be significantly higher, because true tax reform could unleash a lot of the economy's untapped potential. So despite rumblings of progress on tax reform, the market has not priced it in yet. The market remains cautious, just as the Fed remains cautious. 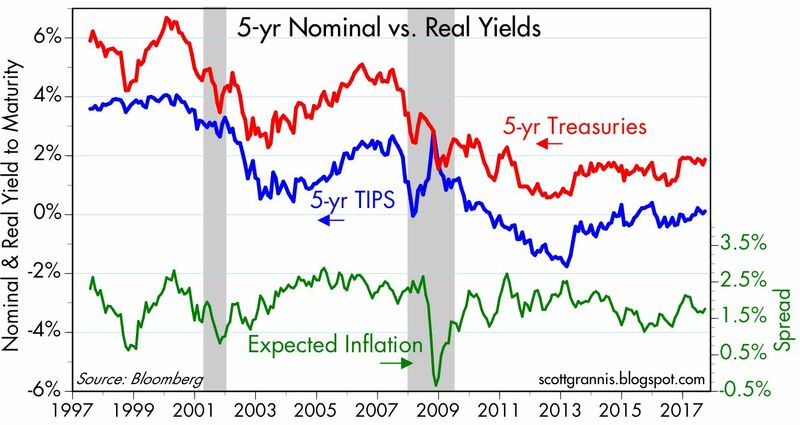 The chart above shows how the bond market reveals its inflation expectations. 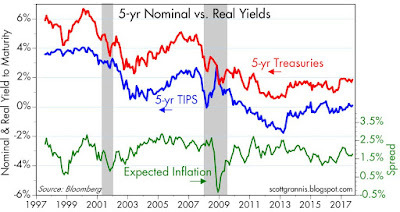 The difference between the nominal yield on 5-yr Treasuries and the real yield on 5-yr TIPS gives us the market's expectations for what the CPI is going to average over the next 5 years. That's currently about 1.75%, which is very much in line with the current level of inflation (the CPI is up 1.9% in the past 12 months, and the Core CPI is up 1.7%). That tells me the market is reasonably confident that the Fed is going to be doing a good job for the foreseeable future. If the market were worried that the Fed was being too aggressive, inflation expectations would be declining. 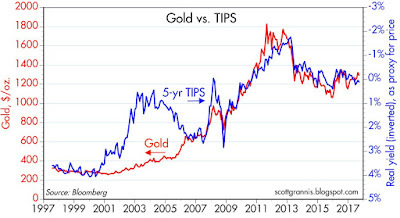 The two charts above compare the price of gold to the price of 5-yr TIPS over different time frames. I find it fascinating that these two completely different assets should behave so similarly. 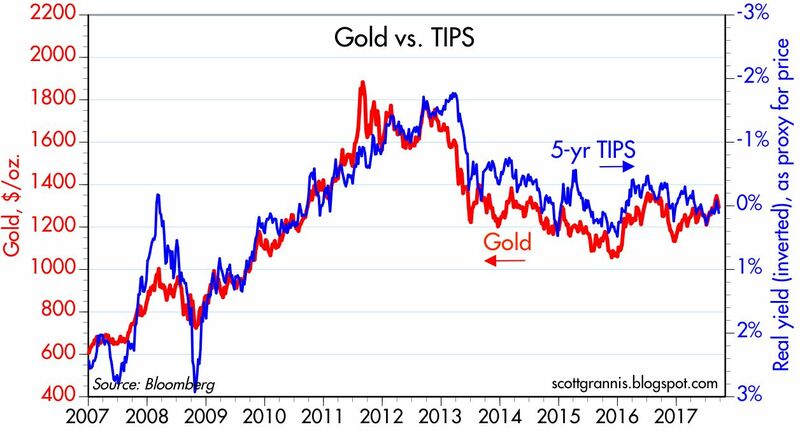 If anything, it means that strong economic growth (which typically coincides with high real yields such as we had in the late 1990s) depresses demand for gold, and weak growth increases the demand for gold. 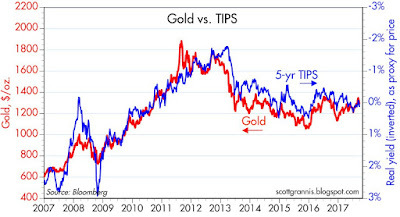 That in turn suggests that buying gold today is a hedge against a weaker economy. 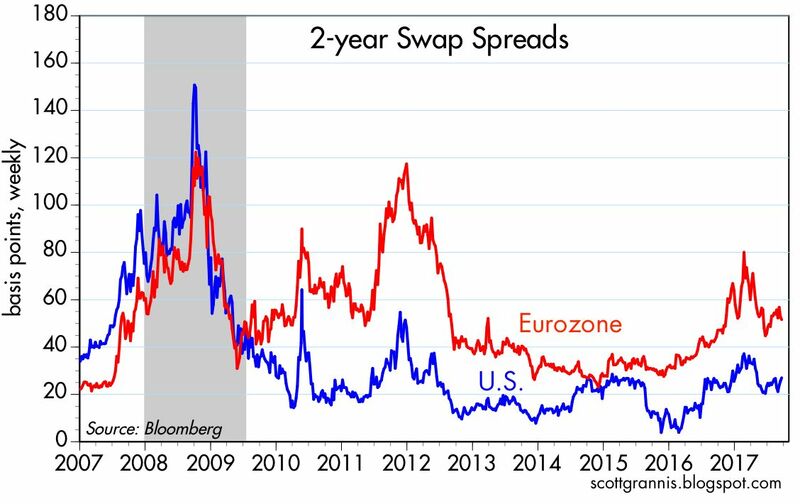 The two charts above show that credit spreads in the US are at relatively low levels ("normal" swap spreads are 15-30 bps or so). That implies that systemic risk is low, liquidity is plentiful, and the economy is unlikely to throw a wrench into the sales and profits of the US economy's businesses. Conditions are expected to be good, and profits are expected to rise. The Fed is years away from creating a liquidity squeeze, which could only be precipitated at this point by a massive reduction in bank reserves. 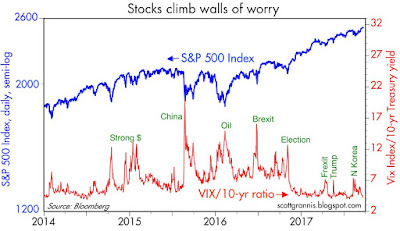 In the absence of obvious or budding threats to the economy, investors find it difficult to resist the stock market, which continues to drift higher. At the current PE ratio of the S&P 500 (21.5), stocks have an earnings yield of almost 4.7% (i.e., if companies paid out all their after tax profits in the form of dividends, the market's average dividend yield would be almost 4.7%). That yield beats the 4.3% yield on the average BAA corporate bond, and it towers over the 1 - 2.8% yields to be found in savings deposits and the Treasury market. Since stocks uniquely can be expected over time to produce capital gains in addition to their yield, the only reason the market would price stocks to yield more than bonds is that the market does not expect earnings to rise, and to more likely fall. 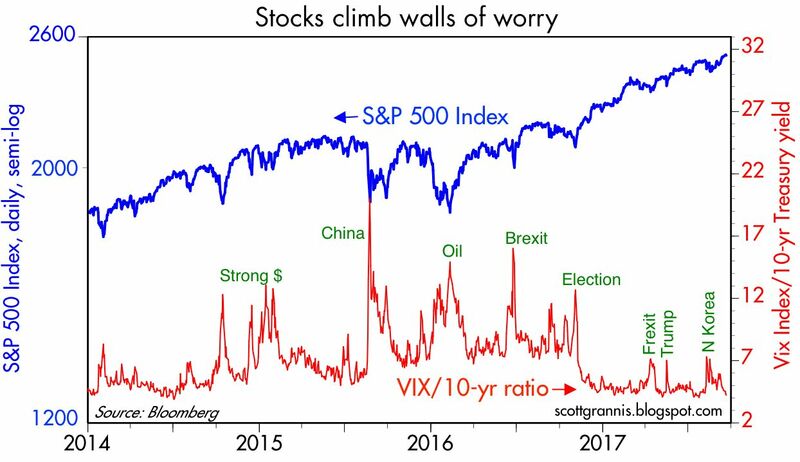 Again, this is a sign of market caution. But what is slowly happening is that the yield on stocks is declining as their prices rise, and the yield on cash is slowly rising as the price of money declines. This process could continue for some time to come, as the Fed sets the pace for the yield on cash and the market balances the expected risk-adjusted yield on equities with the risk-free returns on cash. It's a big balancing act that could be disrupted by unforeseen events, but for the time being it looks like everything is working out OK. If something about this picture changes, I'd bet that it's the outlook for growth, which could improve if and when Congress manages to pass meaningful tax reform and privatize—at least to some extent—the healthcare industry. That would trigger reduced demand for money (since it would boost confidence and make risky investments more attractive), and that in turn would compel the Fed to accelerate rate hikes and the unwinding of QE. But even if all those good things came to pass, I would not expect to see the future returns on equities exceeding the returns we have seen in recent years. Stocks are no longer cheap and are instead arguably overvalued; dramatic grains from these levels are thus unlikely. Shouldn't the third from last paragraph say the market does NOT expect earnings to grow? I very much look forward to your posts and always enjoy and find value from reading them. This post is no exception. Very well thought out, logical, and deceptively simple. It almost makes me with I had chose to pursue a career in economics as opposed to engineering. Thank you for providing a concise hype free assessment of the economy. What happened -- two weeks ago you were all about new metrics for justifying that stocks were cheap? Its not that I agree or disagree, I just don't see the reason for your capitulation on future market momentum. Note: BTW primary sign that the market is expensive -- growing momentum of new metrics to justify current valuations. The end of QE is driven by despair; its evident that the pension market cannot survive with interest rates as low as they are today. Its been nearly a decade of ultra low interest rates, for the central banks its time to normalize -- just look at Canada that just pushed rates up by 25 bps -- my spidy sense tell me that there's another two rate rise. sgt red: you are correct. Thanks for the edit! Now corrected. Frozen: In the post you refer to I merely wanted to argue that stocks are not necessarily overvalued. Question about healthcare - why wouldn't business' want a single payer system to free them of much of the administrative tasks and costs of providing benefits to employees? Dan: in my opinion no one would want a single payer system. There's no free lunch: someone has to pay the tab. When that someone is the government and not the patient, you are inevitably going to have price fixing, rationing, inefficiencies, mandates, poor quality, etc. What business and everyone else should want is less government meddling. The government should either allow everyone or no one to deduct healthcare costs. That would free companies from the task of providing healthcare (people would be indifferent, from a tax standpoint, to getting their own policy or getting one from their company. This would put consumers in charge, and that's when things can start getting efficient. 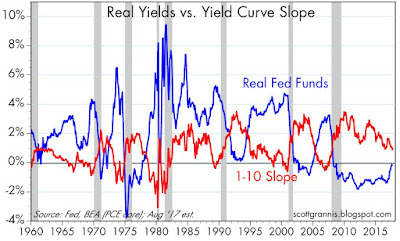 A Bloomberg article, https://www.bloomberg.com/view/articles/2017-09-21/there-s-a-new-yield-curve-to-predict-recessions, postulates that the traditional treasury yield curve may give false signals at the "end" of this expansion. 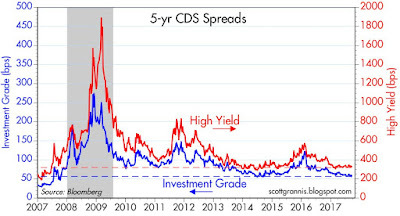 Do you track the CDS HY spread curve? Do you think it adds meaningfully to your discussion above (which is great!). 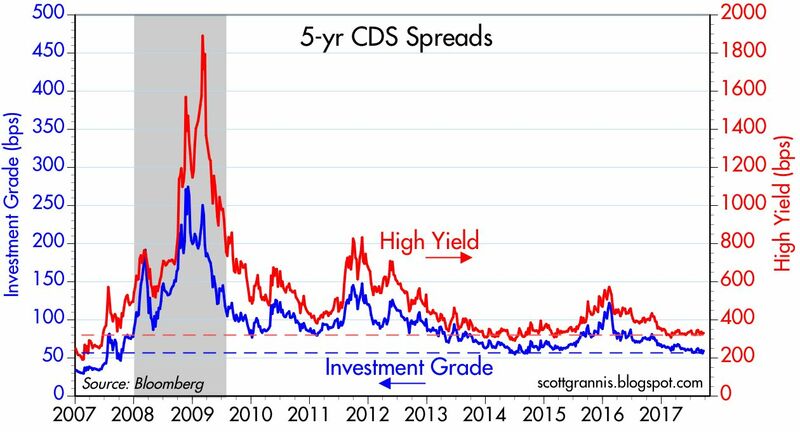 I haven't paid much attention the CDS HY spread curve, but I don't believe that the Treasury curve is no longer a reliable indicator. In particular, I don't think 10y Treasury yields have been artificially depressed. Actually Scott there is a free lunch in universal healthcare: administrative charges. That's it. Aside from that its pure rationing of available resources. Just look North; administrative expenses for the Canadian healthcare system are a small fraction (about 2%) when compared to the US system (anywhere from 10% to 25% depending on who you ask. Frozen: you make a valid point. The question then becomes whether the savings from increased efficiency and competition in a market-driven healthcare system would exceed the savings from reduced admin costs under a single payer system. I would certainly hesitate to give the advantage to a single payer system, since that virtually guarantees inefficiencies and higher costs for everyone. I'd put my money on a free market system any day. If government controls all the healthcare, how does anybody know what the price of anything should/would be?? Shortages and rationing would be inevitable. Especially if the US (which props up global markets) is the last to finally capitulate. And who wants to be enslaved by government control of any necessary resource?? Look at the terrible healthcare in the countries that have tried it. Never understood the appeal of the Soviet model. Advocating for a total government takeover of health care seems insane to me. The employer provided system we have is about the stupidest system imaginable. Scott has outlined some of the reasons; I'd note that even without the perverse tax incentive, there is no way in hell that I will ever have the negotiating power (on my own) to obtain the good health care coverage at a reasonable price that my employer can. So... I'm basically being a good boy and sticking with my current employment even when I know I could be more productive on my own. I'm not 65, when I can have access to socialized medicine. I'm not retirement age, when my current employer will give me the "right" to buy decent health insurance through them even when I'm not working for them (and I will be grateful for that, but it is years away). I have to assume, all evidence to the contrary, that Republicans will get their stuff together and repeal ACA eventually, at which time I will also lose access to government subsidy on otherwise overpriced non-employer obtained health insurance (seriously so at my age and for the next several years). For all of the problems with healthcare in other developed countries (and there are many; they are as diverse as are the many different kinds of "socialized" healthcare), there is not one that has the crazy perverse incentives that our system has. Well, that's a challenge for someone to find one. Maybe there is one developed country somewhere that is worse than us. But I don't know of it. Charlie: thanks, you are so right. The more the government tries to “fix” something the worse it gets. We’ve got to get back to a natural, free-market environment for healthcare, where you don’t need an employer to negotiate a good deal for you. In a free market system, 200 million adults would be negotiating daily to bring prices down to reasonable levels, helped along by the absence of a monstruous bureaucratic nightmare that requires doctors to spend hours every day filling out forms, etc. Great wrap-up, even if I disagree on unwinding QE. 1. For decades, we have been treated to catastrophe scenarios if the federal government kept running up deficits (see James Grant). Well, evidently the welfare-warfare deep state is too powerful for Bush, Obama and now Trump, and there will be large federal deficits for at least another eight years or so. Does the federal deficit matter? 2. In Japan, the Bank of Japan has much, much larger balance sheet than the Fed and is adding to it continuously. Yet Japan is still near deflation. What does this mean? If a central bank can buy back government bonds without inflationary result, should it? Why or why not? 3. Capital markets are globalized today. The Fed selling $2 trillion in bonds---what does that mean in a global context? I can't imagine it will do anything. And from what I read, the Fed cannot sell more than $2 trillion in bonds, as so much more US paper cash is in circulation (and rapidly rising), that it have to keep a $2.5 trillion balance sheet within just a few years. (Believe it or not, there is nearly $5,000 in cash in circulation for every US resident, and the Fed says that is headed toward $7,000 in the next several years. 4. Should we dispense with federal deficits, and just move to helicopter drops? You know the really cool thing about macroeconomics? No one is ever wrong! so it appears the business cycle has disappeared then? One could argue that there never was a "business cycle." That the pattern we observe in the economy over longer periods was driven by the Fed and its errors. It's a fact that every recession in the past 65 years was preceded by very aggressive monetary tightening, which in turn was driven by a desire to bring inflation down. And the source of the undesirable inflation? The Fed, of course. It is axiomatic therefore that IF the Fed doesn't make any "mistakes" we could expect no recession? No disrespect Scott but that seems extremely far fetched and I would argue not necessarily desired. Recessions at least theoretically rid us of inefficiency so that business can rebuild to new heights. No? 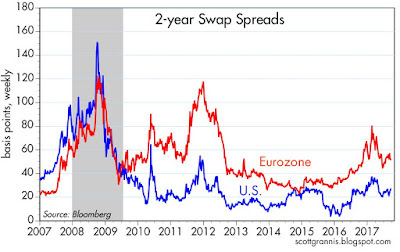 Scott, would you say the same about bunds or worse French bonds? Are their prices not manipulated? Trump tax plan out (well, sort of. Still somewhat sketchy). But looks like the big deficits of the Bush jr, era, which were matched by the big deficits of the Obama years, will again be matched by big deficits from the Trump team. Balancing the budget is always far off on the horizon. For decades, we have been told these large federal deficits and mounting federal debt would be catastrophic. Well, here they are. The US as Puerto Rico? Greece? Or QE to the rescue? Is Japan the future (the huge federal debts bought back by the Bank of Japan). If the tax cuts work and economic growth accelerates, the debt won’t be a problem. Growth is the most important component in determining the burden of a given debt or deficit. Well, I am tempted to say, "There is no such thing as a bad tax cut." But even if we accept that the Trump cuts lead to measurably higher GDP growth, no one is even pretending anymore to see a path to balanced US budgets. James Grant must be in catatonic hysterics! The US national debt to GDP level is rising, and I think in the real world will continue to rise through the Trump years, all four or eight of them. That will mean 24 straight years of pretty big federal deficits and rapidly rising national debts, even though in most years we had a growing economy. For me, this brings into the discussion QE or helicopter drops. Can ballooning national debts, cited as catastrophic by many, be tamed through QE? Just buy the debt back, ala the Bank of Japan. The BoJ owns half of Japan's national debt,and no inflation in sight. Why run budget deficits at all? Why not do helicopter drops to finance that portion of the budget not financed by taxes? Interesting times. I suspect will we see to growing national debt to GDP for at least another eight years. PS the global bond market is now above $100 trillion. The Fed selling $2 trillion of bonds in the next 10 years---that will do anything? Are people deluded?